©1962, The Brethren Press, Elgin, IL, pp. 109-116, reprinted by permission. The month was September, the day was Sunday the fourteenth, and the year was 1862. There was a haze over the distant mountain off to the east. The corn was ripening in the autumn sun. The leaves of the oaks and the maples in the nearby grove indicated the change of the season. The Cumberland Valley, always beautiful but never more so than in the lazy, hazy days of September and the following colorful days of October, lay bathed in beauty. From over the dirt roads, flanked by the split-rail fences, came people on horseback, on foot, and in carriages. Along the sunken road, soon to be baptized with blood as Bloody Lane, came the Mummas and others who lived east of the little church. Along the Hagerstown Pike to the north, and also from Sharpsburg on the south, came the worshipers. It was a sober and thoughtful gathering, for the terrible war was coming closer. Over all there must have been a sense of impending tragedy. Yet little did they realize that within a relatively few hours this lovely spot would be the focal point of a bitter struggle and that they would be within the Confederate lines. On the ridges puffs of smoke could be seen. From time to time the boom of cannon could be heard. But no man could know what the morrow might bring. The church to which these people came has been variously known as the Mumma church, the little white brick church, and the Antietam Dunker church. Located on a hill overlooking Sharpsburg as well as Antietam Creek, it was surrounded by sturdy trees. The main road from Hagerstown to Sharpsburg passed by on the east side of the structure. The minister who was to bring the message that morning was Elder David Long. At that time he was in his prime, being forty-two years of age. Already he had won the respect not only of his parishioners but also of other people in his community and far beyond its borders. Elder Long lived some little distance northwest of the church. That memorable Sunday he took his place, following the usual greetings of friends and fellow members, in the pulpit or, rather, behind the table, for the Brethren felt that all should occupy the same level in the services and did not place raised platforms in their church houses. The hymn was announced and lined, and the congregation sang it spiritedly. At the proper time the elder opened the historic and now-famous Bible, read a psalm, announced his text, and preached a fervent sermon. Following the lingering good-byes, with which were mingled the expressed hopes of meeting again, the members went their separate ways to their own homes or to the homes of friends. Samuel Mumma, as was the custom of that day, had guests for the noonday meal at his home a short distance to the east of the church. In the afternoon some children who had been playing outdoors came running in and reported seeing smoke on South Mountain, not far east of the Mumma home. The battle of South Mountain was beginning. It is quite unlikely that the full import of what might lie ahead was realized by anyone. That afternoon, even as the Confederate lines were forming north of the Potomac, over a hundred people made their way to the commodious home of Elder Long, where they must have contemplated seriously the events of the day and the prospects for the future. The story of the happenings which centered around the little church has been told in the preceding chapter. Elder Long’s grandfather, Isaac Long, who lived in the middle of the eighteenth century, adhered to the River Brethren faith. Though he had not been ordained, he loved to exhort. 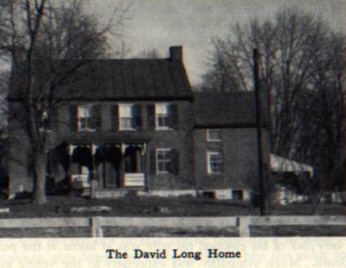 David’s father, Joseph Long, was a deacon and an influential leader among the Brethren. His mother was the former Nancy Rowland. David Long, the subject of this chapter, was born in Washington County, Maryland, on January 29, 1820. In 1826, when the Annual Meeting was held in that county, Joseph took the six-year-old boy along with him. Being too young to be interested in the sessions, David spent much of his time playing with Mary Reichard, the daughter of Daniel and Catherine Reichard, on whose farm the Annual Meeting was held. This friendship eventuated in their marriage in 1841. Even though David was an eager student he had few opportunities for securing an education. To a large extent he was self-taught. To ensure having a good vocabulary, he secured a dictionary and read it from cover to cover. By this means he learned to express his thoughts clearly. The Longs took title to about two hundred acres of land; it was part of the Conococheague Manor, a tract owned by General Samuel Ringgold. Their home was like the average home of that day - built to accommodate both family and guests, for all of whom there was ample room. Many were the Brethren who were entertained in the Long home. During the battle of Antietam this house was within range of both armies; although the soldiers tramped over the farm, damaging it as they went, little damage was done to the house. One day a cannon ball penetrated the east wall of it. As this sketch is being written the owners of the Long farm are Mr. and Mrs. Charles Shaw. David and Mary Long were the parents of twelve children, eleven of whom grew to manhood and womanhood. Of the six daughters, three married ministers; of the five Sons, four became ministers. When David was twenty-three he was elected to the office of deacon. To the Brethren in those days this meant being a person of great promise, for they were slow to lay hands on those young in years. Having made good in this office, he was elected to the ministry when he was thirty. On the very day of his election his wife was at home at the point of death. Much sympathy was expressed to the young man who, many thought, would be left alone with his young family; Mary recovered, however, and lived to sustain and strengthen him in his new duties. In the course of time his home church, Manor, advanced him to the full ministry and he became the elder, or bishop, of what is now the Manor, Beaver Creek, and Hagerstown district. He was plain spoken, a skilled executive, and was trusted by all. In the community as well as in the church he was held in respect and confidence. Many people entrusted their investments to him without requiring any papers. His word was as good as his bond. A man of more than average intelligence, he had a strong, active mind and a character conspicuous for uprightness and integrity. In his church relationships he was a hard worker and was called upon from many quarters for advice and help. In fact, he gave of his time and his means so freely that his personal affairs suffered. When his estate was settled, the assets just canceled out the obligations against it. His day was that of the free ministry, when it seemed, in the thinking of most Brethren, that the minister must make the major sacrifices. One person remarked to the author that the minister barely eked out an existence while the deacons left farms to their children. Elder Long traveled over much of the East in connection with his ministerial duties, largely at his own expense. His expense accounts for attending Annual Conferences - he did receive some financial help when attending them - were always small, for he traveled in the most economical manner. He preached many funerals, stopping his own work to do it. He likely married more couples than anyone else in the community did. It was his custom to hand to the bride the fee given to him. One young man heard of this, and, desiring to impress his bride, gave Elder Long a ten-dollar bill. This was the last one he had, but he expected it to come back. However, this happened to be a time when the elder found that his expenses were greater than his income and, much to the chagrin of the young man, he kept the fee. "Don t you take any offerings?" "No," said Elder Long. "The gospel is free." "I pay for my tobacco and my liquor and I am ready to pay for my preaching. Take this money," the man replied. This was the only remuneration received for either his expenses or his services on that trip. One writer of that far-off day said of him: "In his connection with the church, Bishop Long was an acknowledged leader in this state and was one of the strongest pillars of the church organization. For many years he represented his people at the annual conferences of the church, and he exerted a deep influence upon the church throughout the country. He has gone to Pennsylvania and the Western states as a delegate in his church so often that he became one of the most widely known men of his day in the church. He indelibly impressed his earnest convictions upon the ministry and the laity and defended the tenets and customs of the church in a forcible manner which has done much to preserve and identify the Dunkard church throughout the country, which is a strong and vigorous denomination." Professor J. M. Henry, of Bridgewater, Virginia, wrote of Elder Long: "His ministry had great influence. He preached at many mission points, served on important committees of Annual Meeting, conducted many funerals, performed more marriage ceremonies than any [other] man of his community, lived an active, busy life in his own congregation. He was a man of dominant personality, commanding in appearance, and very serious minded. "His work has been evaluated both critically and appreciatively. He was austere in church discipline, but kind hearted in disposition. He made some enemies by his straightforwardness but won a host of friends by his piety. His uncompromising attitude during the declining years of his ministry crippled his usefulness, yet friend and foe believed in his sincerity." When the Annual Conference of 1880 was held in Hagerstown, Elder Long had charge of the arrangements. He showed remarkable ability and a mastery of details which won for him the praise of many and contributed largely to the success of the Conference. Living on the border between the free and the slave states, he nevertheless made his position on slavery clear to all. One day in attending a slave auction he bought all the slaves and set them free. In his attitude toward slavery he reflected accurately the position of the Brethren. The methods of John Brown and the methods of the Brethren, all aimed at the same end, were entirely opposites. In the war that came about in part because of slavery the Brethren were loyal to their government but opposed war as a means of achieving righteous goals. Denied the education he craved for himself, David Long aided his children in every way possible to secure educations. One son, D. Milton, was known as a "bookworm" and liked nothing better than "having his nose in a book." In this tendency he was encouraged by his father. A privately owned and conducted school had been opened in Hagerstown in 1878 by Thomas and Rebecca Cochran. Having a small patronage and in time being offered for sale, it was purchased by David Long and his son Melvin for twenty-nine hundred dollars. Melvin Long became the principal of the school, which was renamed Linden Seminary. The highest enrollment during the period of operation being only seventy-four students, the seminary was discontinued after a number of years. But the relentless press of time sweeps all before it, and on January 23, 1897, Maryland s well-known Civil War preacher went to be with his fathers. Had he lived until Friday of the next week he would have attained the age of seventy-seven. He was active and vigorous until within a few days of his passing, when he became ill with pneumonia contracted while trying to reach one of his preaching appointments during very adverse weather. His wife, widely and affectionately known as Aunt Mary Long, had died about eight years earlier. The oak grove surrounding the church where David Long preached that September morning in 1862 was plowed and scarred by cannon shot and is now gone. The old rail fences along the Hagerstown Pike are no longer there. The old church is gone, with nothing remaining but the hilltop and the foundation. Other buildings have been erected where the Mumma farm buildings were burned. The soil enriched by the blood of the nation’s young men produces in abundance. The sunken road, now Bloody Lane, is viewed casually by the rapidly passing traveler. The sun which once glistened upon flashing arms now glistens upon countless monuments erected to the memory of the men who wore the blue and the gray of a century ago. The fields which echoed to the feet of marching men and galloping horses are now echoing to the exhausts of farm tractors. The hills which once gave back the echo of the cannons roar and the sharp crack of the rifles now give forth the sounds of industry and peace. Elder David Long, veteran and effective preacher of the gospel of Jesus Christ as it was understood by the Brethren, is likewise gone. But the principles and the spiritual undergirding of life for which he stood are as virile and as timely as ever and will so remain, for the truth of God is unchangeable.